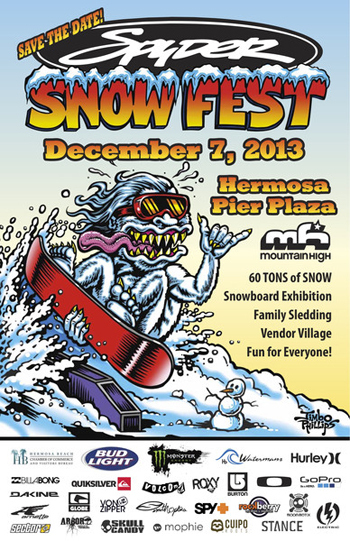 The third annual Spyder Snow Fest presented by Spyder Surfboards, powered by Monster Energy and Mountain High Resort will descend upon Downtown Hermosa Beach on December 7, where 60 tons of manmade snow will transform Pier Avenue into a Winter Wonderland. The free, family-friendly affair will kick off of the 2013-2014 Snow Season and unite the community and top snow industry brands alike beginning at 12:30 p.m.-3 p.m where kids under 15 will be treated to a one-of-a-kind sledding experience supported by Peace Tea. From 4 p.m.-6:30 p.m., Mountain High pro snowboards will show off their skills in snowboarding demos and exhibitions on “Mount Hermosa,” the stretch between Manhattan Avenue and Hermosa Avenue. Using a new Steeper and bigger snow-covered scaffolding that reaches over 27 feet and an assortment of snowboard rails and fun boxes from Mountain High Mountain, the snow will be shaped and sculpted into a snowboard terrain park for pro and amateur riders to compete for the Best Trick award. Celebrity judges will include be emceeing the event. Mountain High pro snowboarders Cory Cronk, Trever Haas and Kyle Lopiccolo will be among the pros who will take center stage in the snowboard demo and exhibitions. Spyder Snow Fest 3 partners include Monster Energy, Mountain High Resort, Peace Tea and many others who will offer free giveaways, interactive product demos and activities in vendor village such as Burton, Quiksilver, Hurley, Electric, Globe, Sector Nine, Matix, DVS, Oakley, Volcom, Billabong, Arbor, Spy Roxy, Soul, Skull Candy, Mophie and more. Spyder would also like to thank the City of Hermosa Beach, Hermosa Beach Fire Department and Watermans Hermosa Beach for their support for the last three years. Following the events of the day, Watermans will also host the official post-Spyder Snow Fest party. Additional details for the event will be posted on www.spydersurf.com and Spyder Surfboards Facebook page.